The past few weeks I have been participating in a weekly farmers market. 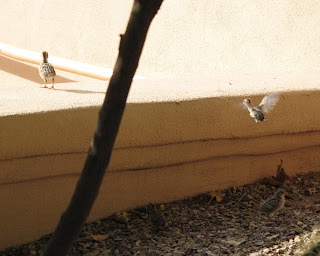 If you are in Tucson, come check it out - Fridays from 8AM-1PM on the southwest corner of Broadway and Country Club. With that being said, I won’t be there for the next two weeks. Why you ask? Great question; which brings us up to our next segment of news. Upon my return to Tucson, I will be spending the rest of the week in the field as the location photographer for Geoff Notkin while he’s filming the new Discovery Science channel show Meteorite Men (picked up for 6 more episodes, thanks for watching.). After that I will be returning to the farmer’s market schedule with the addition of the Saturday farmer’s market at St Phillip’s Plaza at River and Campbell. Hope to see you there. So, new desktop installment for this newsletter: I had a tough time deciding on a photo this time around; so many photos so few newsletters. However, I had such a great response to the horse and dog nose photo (thanks so much for the feedback) I thought I might continue the animal theme. Today you will be getting 2 photos since I couldn’t decide between the two. 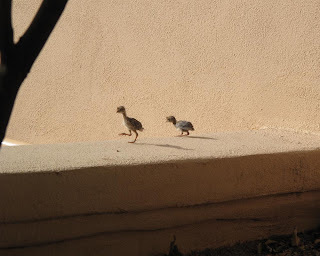 These little Gamble Quail babies were chasing after Dad and Mom who didn’t have quite as much of a problem jumping over the wall and down to the sidewalk on the other side.